MeshLab is an Open Source program designed to manipulate and modify 3D mesh data. To do this, it offers a set of tools that allow cleaning (removal of duplicates, elimination of isolated components, consistent unification, automatic filling of holes, etc.). ), correction, smoothing, remeshing (simplification, subdivision, surface reconstruction, etc. ), noise suppression and conversion under the following formats: PLY, STL, OFF, OBJ, 3DS, COLLADA, U3D, GTS, X3D, VRML, DXF and IDFT. In addition, MeshLab offers other tools such as the measurement tool which is able to measure linearly the distance between the points of a mesh or the cutting tool which can export flat sections of a mesh in SVG format. 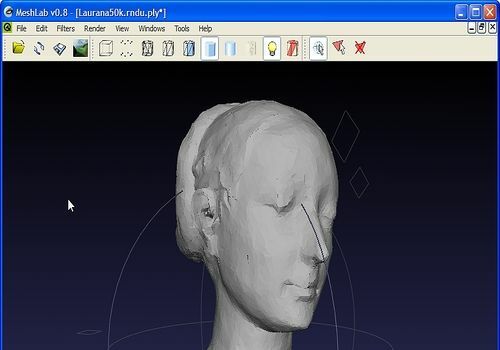 3D analysis tools are also available in the software: equipped with the powerful algorithm "Poisson Surface Reconstruction", MeshLab can merge several meshes. It should be noted that prints can have a rendering of up to 16k x 16k.